One of my son's favorite breakfast tacos is a nopalito taco. When we get to travel back to South Texas that is usually the first thing he gets when we go to breakfast. It's a popular dish because it has a unique flavor, but it also has a lot of great health benefits. You can usually find nopalitos in the Mexican food aisle in the grocery store. I recommend draining them if you're going to cook with them. WARNING: Cactus are not nightshade allergy friendly! The cactus is characterized by its oblong, flat, thorny leaf pads and scrumptious prickly pears. There are many varieties of cactus. The nopal cactus, or the prickly-pear cactus, is one of the most common varieties used both medicinally and nutritionally. Cactus has been a main dietary staple in Mexico and some parts of Texas for years. It has numerous health benefits and very few side effects. While there's no conclusive evidence that the cactus is beneficial for everyone, some doctors suggest that cactus supplements can help treat type 2 diabetes, as there is a direct correlation between cactus intake and a decrease in blood sugar levels. It is possible that the nopal cactus may also be beneficial in controlling high cholesterol, obesity, colitis, diarrhea, enlarged prostate and treating viral infections. Cactus juice is also used for reducing the likelihood of hangovers from alcohol consumption. It should be taken before drinking alcohol for maximum benefit. 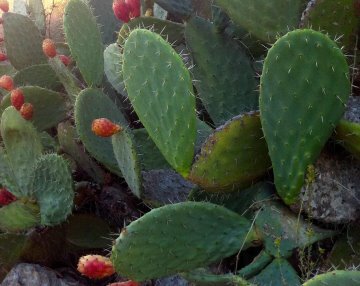 The prickly pear or nopal cactus is safe for most people. However it is recommended that you consume it for only short periods of time. Useful parts of the plant include the leaves, stems, flowers and fruit of the cactus. There have been some side effects reported with the use of cactus supplements, including nausea, diarrhea, bloating and headache. Women who are pregnant or nursing should refrain from eating or taking cactus supplements. Cactus should also be avoided 2 weeks prior to surgery. The nopal cactus has been shown to interfere with several drugs. People taking chlorpropamide, glyburide, glimepiride, insulin, pioglitazone, rosiglitazone, glipizide, tolbutamide and glucophage should not take cactus supplements without doctor supervision. Some of these drugs can have severe, even deadly, interactions with nopal cactus supplements. There are specific dosages for people that want to add cactus supplements into their daily regiment. Diabetics should take 100 to 500 grams of the broiled stems of the prickly pear daily. Doses are often divided into three equal amounts and given throughout the day. As a hangover remedy prickly pear cactus extract should be taken at least 5 hours before drinking alcohol. Preparing fresh cactus is a good way to reap the maximum health benefits of this diverse plant. Purchase small to medium firm cactus pads. Do not buy pads that are wrinkled, soggy, or extremely soft. Make sure to wear gloves when preparing the cactus. Remove thorns by either using a vegetable peeler or by boiling them off in a large pot of water. Boil for several minutes. The cactus pads have a lot of slime on the inside. This slime is actually full of nutrients and can be eaten, if desired. It can also be rinsed off with cool water. Add cactus into any favorite dish like omelets, salads, or tacos. Nopal cactus has 60 calories, 10 fat grams, and 14 carbohydrates per serving. Have you ever used fresh cactus?